The Singapore Army has announced plans to purchase 8,000 iPads for new recruits into the army. According to the Defence Chief, General Neo (no relation to Neo of the Matrix-trilogy, but somehow apt…), he claims that adopting the iPad would enable the Armed forces to harness the technological abilities of the youth. With the built-in camera, servicemen are able to snap photos and video clips in the field that can then be uploaded and could come in handy to carry out post-mission debriefing. There’s more to it obviously, since I think it would be more sensible otherwise to equip all the recruits with cameras, (which would make for a very strange headline indeed). The iPads would presumably also be useful as a learning tool, replacing paper maps, note-taking during mission briefings etc. But I think the iPad would not be sufficiently rugged nor waterproofed to withstand more than a few hours in the field. I struggled to think of a similar non-violent gadget that had widespread civilian acceptance and that was subsequently adopted by the military. Arguably, running shoes would fall into the same category – no one expects soldiers to go to war wearing running shoes, but during peacetime training, the comfort and ease provided by running shoes for keeping fit in the army camp can be justified. The second example is that using laptops and powerpoint presentations for briefings are pretty much part and parcel of classroom-based learning in many advanced militaries. Personally, I think the iPod Touch 4G would be a better choice, given that they are more mobile and less unwieldy than iPads. This story was reported in the local Singapore dailies here and here. 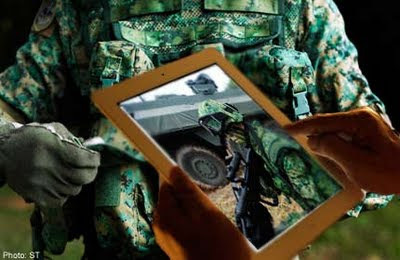 The iPad could be a nice addition, our Army could be planning a big intranet or integrating ns.sg. Recruits could then engage better with specs and officers and create a wonderful experience during their NS time.